unfortunately i missed to take a picture of it's neck, to be sure it's an American or a chinese Alligator,..Couldn't buy it either. So if someone can provide a picture of the neck region, please feel free to post! I also like to get the model either or. 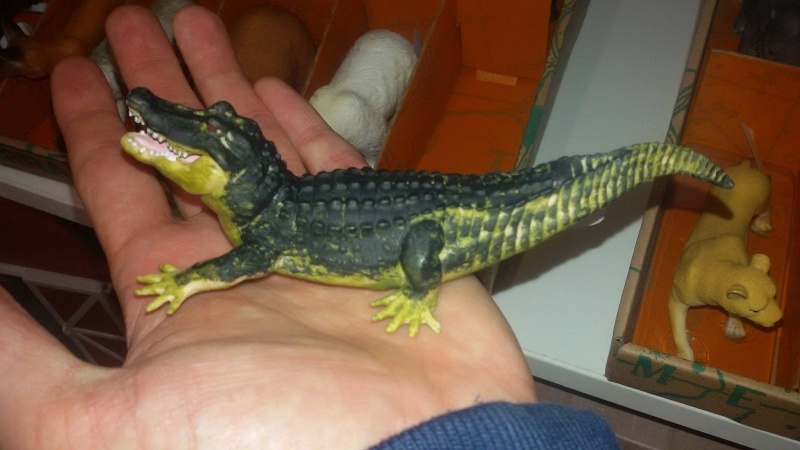 Philipp, I know that companies are not always very faithful to species and that there's always the chance that the sculptor is using wrong pictures to as reference but this alligator belongs to a collection of North American fauna. But, I think it is interesting that someone shows a pic of its neck and I am sure you'll find which species will fit it better. Thanks. Wasn't there a Nayab collection of european animals which actually included an north african ibex and....ethiopian wolf? or the famous PV "Beluga"? ... and several other paradoxal events in this hobby. Yes, we won't give up. Perhaps a new species ? The Allidile ?